R.B. Grant Electrical Contractors provide electric heating systems throughout Scotland from our Fife base. We have 43 years experience installing a range of electric heating. We install reliable, stylish and environmental heating systems that are easy to control, and regulate the temperature within your premises. We keep up to date with the latest electric heating technology and can supply many affordable and low running cost systems. From electric panel heaters, underfloor heating, storage heating, oil filled radiators and electric boilers we offer a full range of electric heating solutions. We provide free quotations and design with no obligation for electric heating in the home or commercial premises. We also provide a storage electric heating repair service locally. R.B. Grant can install, service and maintain a variety of electric heating systems for commercial applications throughout Scotland and Fife. We carry a range of parts for electric heaters and can supply parts for old and new. 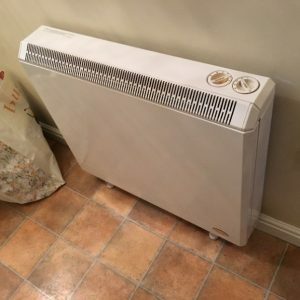 We are approved Dimplex heater installers providing emergency repairs and installation services. We provide reliable and environmental benefits with modern heating systems – for example, when the room heats only when people are present. This can be adapted with an existing heating system or installed with a new heating system. Wireless technology and retro fitting means the system is easy to install therefore excess amounts of cable is not needed. Manage heating around the home in each room with keypads mounted on the wall or remote controls. Manage your home remotely with telephone voice interface, internet or smart phone. Wireless products such as a radiator controller allow easy installation on all the rooms of your homes without disrupting existing pipe work. Affordable alternative to storage heaters. etc.